In this video we can see Russell Lissack playing "This Modern Love" with a Takamine. A good look at the guitar can be had at 0:07 into the video. Hozier used this guitar at Newport folk festival in June 2014 when he played Skip James' Illinois blues. He also used the guitar in other videos of the same song. he has not used it since his global explosion. 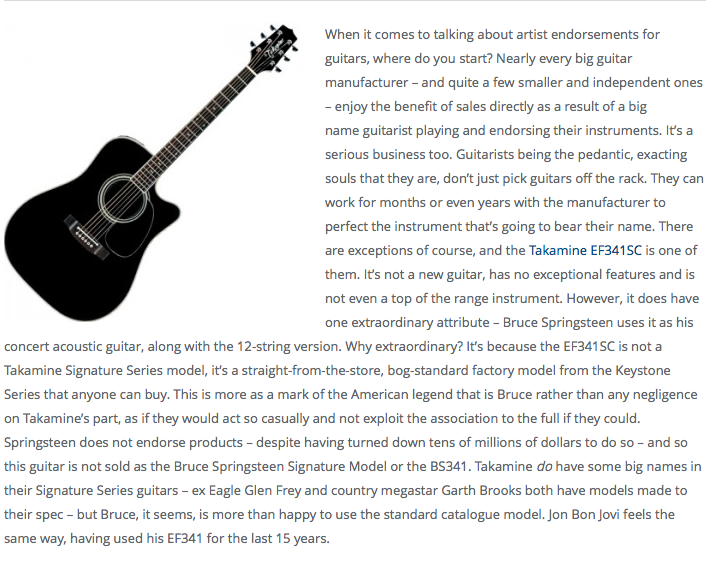 [This article](http://magazine.dv247.com/2010/11/08/takamine-ef341sc-electro-acoustic-review/) states, "Takamine do have some big names in their Signature Series guitars – ex Eagle Glen Frey and country megastar Garth Brooks both have models made to their spec – but Bruce, it seems, is more than happy to use the standard catalogue model. Jon Bon Jovi feels the same way, having used his EF341 for the last 15 years." In this photo, Bruce Springsteen can be seen with his Takamine EF341C guitar. On the left, you can see a Takamine 12 string. Danny Jones is playing a Takamine EF341SC Bruce Springsteen edition, cos he is a huge fan of him. The rosette matches the [EF341C](http://www.takamine.com/EF341SC) and the pickup control also matches the [EF341C](http://www.takamine.com/EF341SC) as seen at 3:12 in the [video](https://youtu.be/hLMiFhp7PuA?t=192), can be compared to the picture [here](http://www.musiciansuniverse.com.au/Uploads/Images/ef341sc-94q.jpg). Ron's "Propagandhi" Takamine has been his main acoustic since the earliest days of The Lowest of the Low. A great guitar. At the time I wanted a green acoustic / electric and found this at Kelly's. It was a great price, easy to play, the color was just what I wanted. I still have it and it sounds great, holds tune very well even when I have not played it for a while.